It’s been quite a while since I’ve written up a pub meal (the most recent I think is the Victory at Sellicks) and I think it might even have been that long since I’ve eaten in a pub. Anyway, I’m going to rectify that with two pubs in quick succession. We took the baby for an early Sunday dinner at the Flagstaff Hotel. That’s right – the big, can’t possibly miss 1950s building at the Darlington end of South Road. I guess you could call the Flaggy one of our locals (although certainly not within walking distance). We’ve only eaten there once before (it was a quick lunch back in 2009) so we thought it was time to give it another try. That, and the fact we had an Entertainment Book voucher! The dining room at the Flaggy is massive and, depending on where you sit, you can get some impressive views. The website suggests booking – I scoffed at this. We’re going at 5:30pm on a Sunday night! Well, quite – 5:30pm on a Sunday it may have been but there were several large tables booked and by the time we left the place was heaving. We had a window seat (overlooking the carpark and Flagstaff Road – maybe not the most exciting view ever!) and a spotlessly clean high chair for the baby. One thing to note is that the high chair didn’t have any straps so wouldn’t have been suitable for a very small or very young baby. The menu is, of course, pub staples but the Flagstaff’s distinguishing feature is its massive salad bar which is included in all main course orders. Salad bar isn’t quite the right term for it – it’s more like a giant fruit and vegetable buffet! You help yourself to bread (loaves of all different types in the bread basket) and there are an array of sauces, hot vegetables and fruit as well as the salads. If you wanted to make an utter pig of yourself, you could. Food wise both Andy and I went with the seafood basket – reasonably pricey for a pub meal at $26.50. 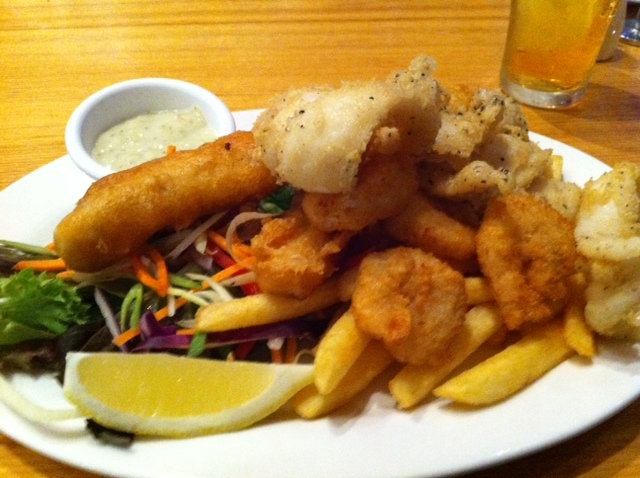 This was a selection of prawns, salt and pepper squid and barramundi (no note of provenance – hopefully it was Australian …), served with chips and salad. I am not so naive to imagine that this did not come straight to the table via freezer and fryer. Even so, given the price, I will note that the (battered) prawns were tough and utterly tasteless – think fried, slightly salty eraser and I reckon you’re on the money. The barramundi came as two fillets – two very thin fillets so that the fish was completely swamped by the batter. I only ate one of mine and fed the rest to Andy and the baby (minus the batter, in the baby’s case, obviously). The highlight of the plate was definitely the squid which was tender, pretty tasty and not at all greasy. Andy, who is something of an expert in seafood baskets, rated this one as better cooked than that at the nearby Victoria Hotel, but said that the Vic’s is bigger and overall better. The chips and salad were pub stand chips and salad. As the wine list was pedestrian I opted for a beer with my dinner. All up I’d rate the Flaggy as perfectly adequate for a pub meal, but on the expensive side. For $26.50 you can go to a lot of more upmarket restaurants and be fed something that takes a lot more effort (Andy’s pork belly at Press was the same price). On the upside, the dining area is massive, there is a small play area and the hotel is clearly set up to cater for large groups. However, for a quick family meal, my vote goes to the Victoria Hotel, further up South Road.